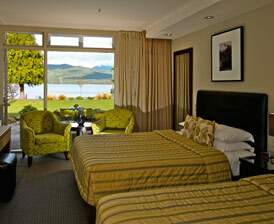 Staying at Distinction Te Anau Hotel and Villas gives you the chance to spend more time with family and friends before or after your wedding. We can offer special accommodation rates for your friends and family during your wedding. The hotel’s 112 beautifully appointed rooms include standard hotel rooms, spacious villa suites, comfortable villa rooms and quality deluxe suites. All rooms offer a TV, fridge, hairdryer, iron and ironing board, tea and coffee making facilities and are serviced daily. The hotel has a variety of facilities available for all our in-house guests to enjoy, including the renowned MacKinnon Room restaurant, The Explorer Bar and Lakeview Terrace, and a spa and sauna complex, and a heated outdoor swimming pool (available during summer months). Distinction Te Anau Hotel and Villas can provide accommodation cards and location maps to insert with each invitation detailing our special Wedding Accommodation rates for your guests if required. If you want to make a weekend of it and have as much time as you can with your family and friends, we have a variety of pre and post wedding meal options which can be packaged especially for you and your guests. For more details on our luxurious rooms and meal packages, contact our friendly Events Coordinator.